As the weather gets cooler, it’s amazing to curl up on the couch with your favorite hot cocoa. And when it’s spiked? Even better! 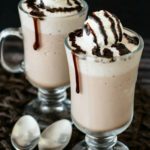 My Bailey’s frozen hot chocolate recipe has all the flavors of chocolate and with the fun zip of the liquor. 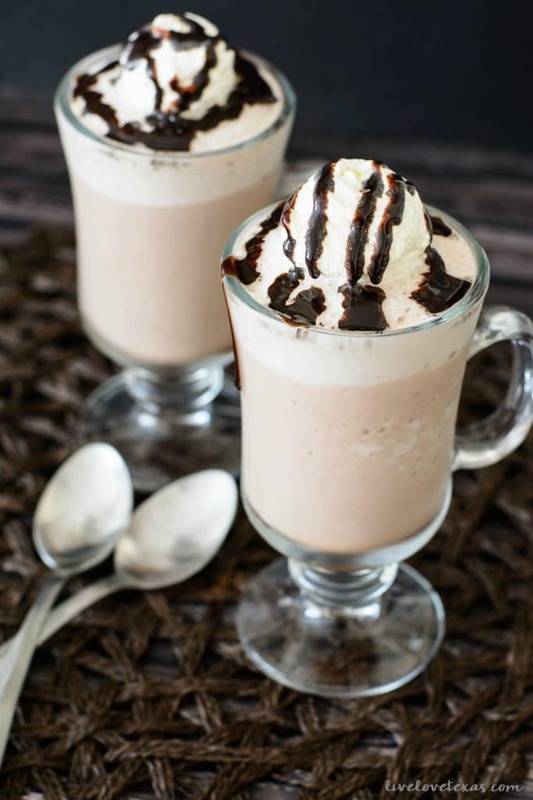 Some of my favorite things in which to indulge are milkshakes, a strong drink, and chocolate. And this has all three mixed into one! What is a frozen hot chocolate? Basically, a frozen hot chocolate is iced chocolate milk. Some people add heavy cream, ice cream, or even ice, to make it thicker and have the consistency of a frappe. The words “frozen hot chocolate” are an oxymoron, and one of my favorite recipes to make. Is Bailey’s good in hot chocolate? Bailey’s is so good in hot chocolate! It definitely an extra layer of delicious flavor! Here are some ideas for different twists on my drink. Try them out one by one. Or, have a few friends over and have a “frozen hot chocolate bar” where you can try out the toppings all together! Up the booze amount by adding either Kahlua coffee liqueur or butterscotch schnapps – or try both! Serve this drink at your next holiday party, or just to unwind after a long day. Here’s my favorite Bailey’s frozen hot chocolate recipe. Honestly, a cup of my boozy frozen hot chocolate is perfect all by itself! It is so rich and luxurious. But if you want a few snack ideas that pair well with it, go for something savory. What are the perfect times to indulge in boozy frozen hot chocolate? Well, it’s 5 o’clock somewhere, right? This drink is pure perfection as a personal treat after a long day. It’s also a lot of fun to drink with your friends or your significant other. Serve this drink at your next party. Whatever the reason, it’s a really indulgent drink and something you really must try. 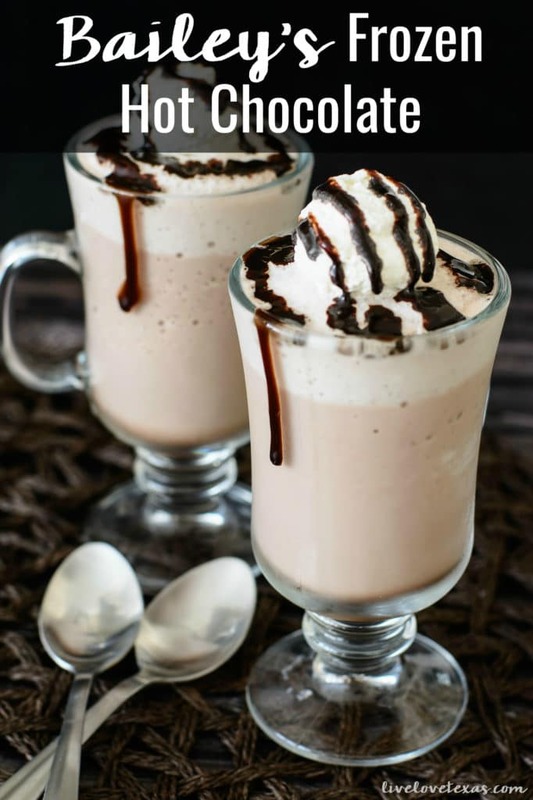 When you try this Bailey’s frozen hot chocolate recipe, let me know by sharing or tagging me on social media! 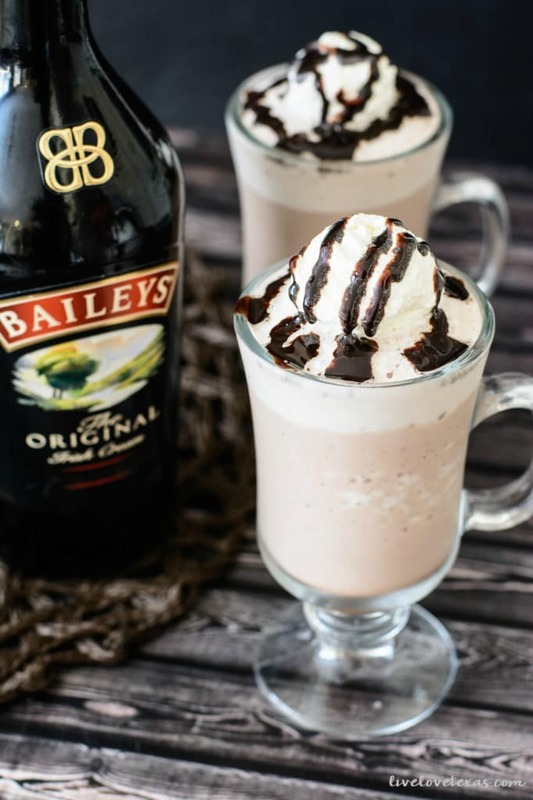 If you love Bailey’s as much as I do, you’ll go crazy for these other recipes featuring Bailey’s Irish Cream! The Bailey’s takes frozen hot chocolate to a whole new level! Delish! OMG! Now THIS is my kind of hot chocolate. nom nom nom.